Footprints for Peace 30 march across Scotland. 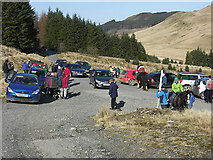 Members of the society begin to assemble above Nant-y-moch reservoir, prior to setting out on a walk to protest against the proposal to saturate this scenic area with a giant wind farm. It is proposed that a substation be built in either Abermule, near Newtown, or Cefn Coch, near Llanfair Caereinion, covering about 19 acres of rolling countryside, in order to gather-in the output from the multitude of wind-farms planned for mid-Wales. In addition, of course, there would also be a need to build a network of pylons to connect them all up and to the national grid. Quite naturally, the people of Montgomeryshire want none of it and this sign on a trailer body beside the A483 between Newtown and Welshpool, just about sums up the local feeling. A measure of the strength of feeling is that some 2000 people attended a protest meeting at Welshpool on April 20th - not a bad turnout for a rural area! 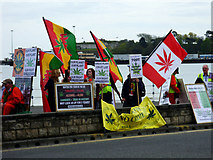 At least the local MP, Glyn Davies, has given them his full support and all credit to him. Watch out any local politician who favours this scheme - you won't stand a chance in the forthcoming elections. I don't believe that there has been such strength of feeling in Wales about a large infrastructure project since the Llyn Celyn protests in the late 50s/ early 60s. It is an absolute disgrace that the Welsh Assembly is sponsoring the project but, even if they did not, I'm sure that the so-called energy secretary in Westminster, the screwball Huhne, would force it through. He is after all, nothing more than a front man for Greenpeace. What price local democracy? It didn't work in the case of Llyn Celyn and it probably won't work in Montgomeryshire. I can only complete this rant by repeating the well chosen words of Montgomeryshire United - "Stick your pylons" and if I may add - AND YOUR WINDFARMS! 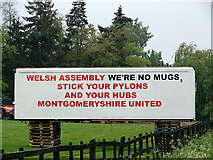 See also SO1797 : Protest sign beside the A483 road.